Leah Kirchmann: Racing in Belgium: Halle-Buizingen! 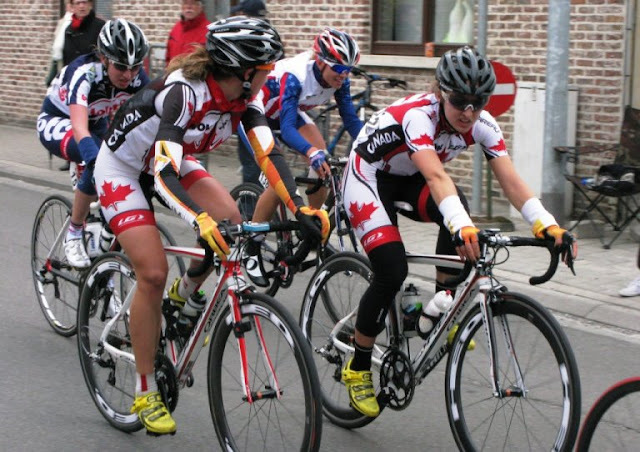 This past Sunday, I raced Halle- Buizingen, a UCI 1.2 race here in Belgium with Team Canada. After 6 days since the last race, I felt quite restless and was ready to ride hard. The whole team was excited about the prospective of racing on some hills after all the flatness of Holland. The 123 km course started with a big 51 km loop that included two short but steep climbs. Then the course finished with 6 laps of a 12 km circuit through town, including a short, but painful kicker, finally finishing on an uphill drag. The goal at the start was to stay near the front for safety and to get in any early moves. I happened to be around the front at the first intermediate sprint, so I went for it placing 2nd. I won the second intermediate sprint points. It was pretty windy on the big circuit, so no moves were really going anywhere. I attacked once and had a short-lived break of 7 going, but it was soon brought back. Unfortunately Leah G. was caught up in a crash in the early race craziness. 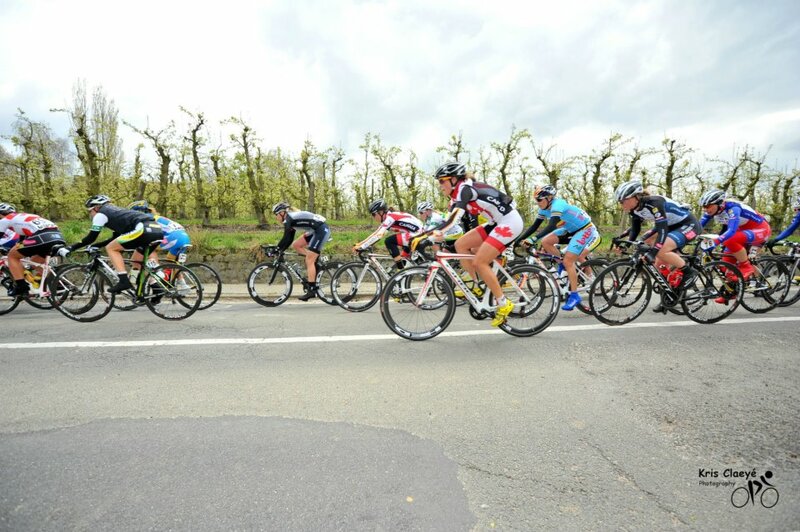 The rest of the team was in good position going into the climbs and made the front group. Attacks started going once we got into the circuits. Not wanting to miss a break, we took turns going with different moves. I soon found myself in a break of 9 that stuck on the first circuit. With all the big teams represented, it looked like the break could potentially stay away. We stayed away for 4 circuits, gaining a 1-minute lead on the pack. I collected enough points on the next two intermediate sprints to solidify my lead in the sprint competition. A Hitec rider ended up getting away from our group and gained a sizable lead. We still had a good gap on the chasing pack, but all of a sudden the gap was dropping fast. It turns out that even though Lululemon had Amber Neben in the break, they weren’t happy with their odds of winning, so brought it back. I quickly found that most of team Canada made the front group of around 35 riders. Rhae, Denise and Jo were there, missing however was Joelle who suffered two mechanicals in the circuits and had not made it back on. With my legs pretty tired from riding the break, it made sense for the team to set Joanie up for the sprint. It was a good call, because she ended up fifth! Chloe Hosking won the sprint for Lululemon. Overall it was a positive race, some good and bad events for the team, but that is bike racing after all. Next up is Omloop Borsele and GP Roeselare next weekend. I hope it warms up, the weather is quite frigid at the moment.